Photosynthesis and Cellular Respiration are both processes that transfer energy for a plant to use. This experiment tested how many bubbles of oxygen were created per each minute up to five minutes when an Elodea plant was placed in front of different light sources. The more natural the light was, the better the evidence of photosynthesis that occurred was shown. Photosynthesis uses Carbon Dioxide, Water, and light energy to produce Glucose and Oxygen. 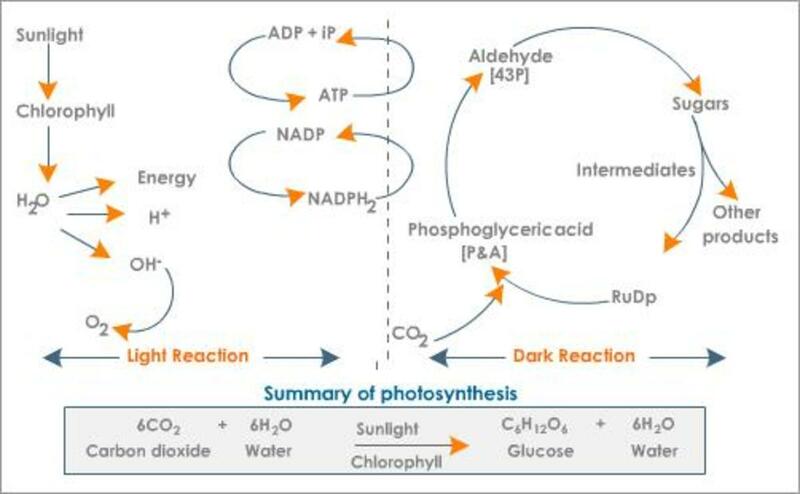 This is a light reaction which takes place in sun light, and it is also the way most plants obtain their energy to live. 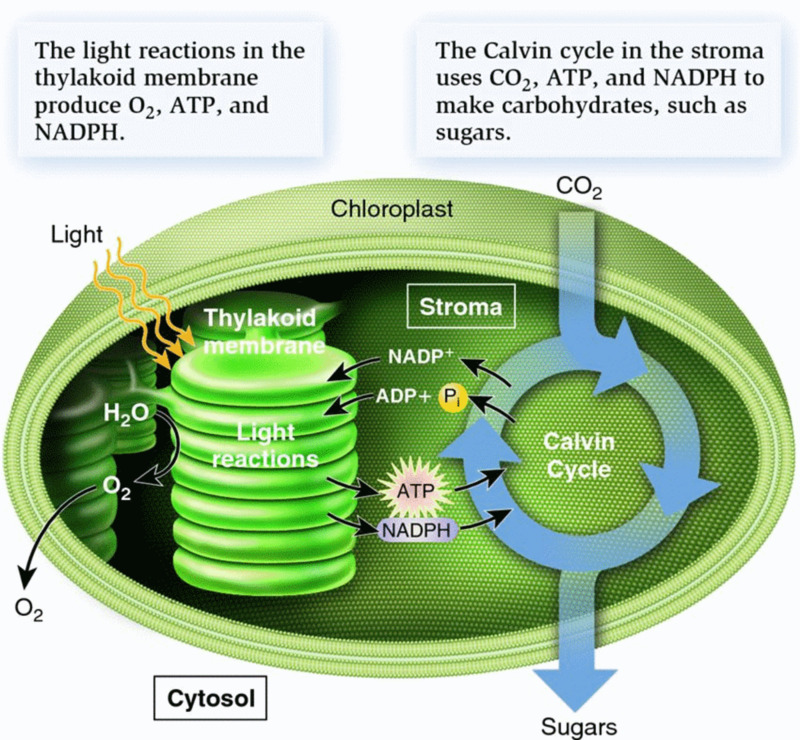 Cellular Respiration uses Glucose and Oxygen to produce Water, Carbon Dioxide, and energy. This is a dark reaction that takes place without sun light and is the way animals and other living beings actually live. In this experiment, there were four different types of light used to find out the rate that photosynthesis produces oxygen bubbles that included sunlight or a reflector lamp, daylight, diffuse light, and darkness. 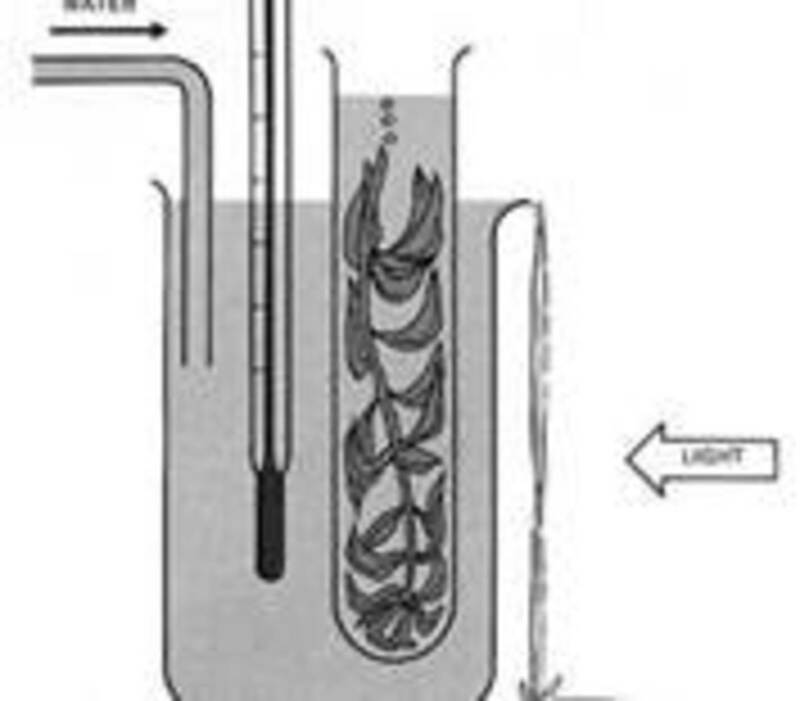 For this experiment, the plant, Elodea is placed in front of different intensities of light to determine the number of oxygen molecules produced. When the experiment is repeated in each different light, you can decide which process of transferring energy is used most effectively. The ultimate goal is to determine what procedure of transferring energy is most efficient. This experiment was performed to figure out how sunlight affects the rate at which photosynthesis is completed. Four different types of light are needed for this experiment to be completed: sunlight or reflector lamp, daylight, diffuse light, and darkness. By using the different types of light, the rate of photosynthesis was accurately measured. Place four sprigs of Elodea (Anacharis) to four test tubes filled with water. Once the Elodea is in the tube add a small amount of sodium bicarbonate to the water. This adds some carbon dioxide into the test tube. Place the test tubes with the sprigs of Elodea under the different light sources, one test tube for each light. Leave each of the tubes under the lights for 20 minutes. After 20 minutes is up, take the test tubes out from under each type of light and start to count the amount of bubbles that rise to the surface. The bubbles are oxygen molecules that are being produced through photosynthesis. Count the number of oxygen bubbles that come to the surface of the test tube water for a minute and record it. Then continue to record the number for five minutes and record it. Now the rate at which the chemical reaction of photosynthesis to produce oxygen is known. The Daylight provides the best rate of oxygen production compared with all of the other types of light. This shows that a reflector lamp may be too intense for the Elodea to produce oxygen and the other two types of light, Diffuse light and Darkness, have too little light too make the rate improve. 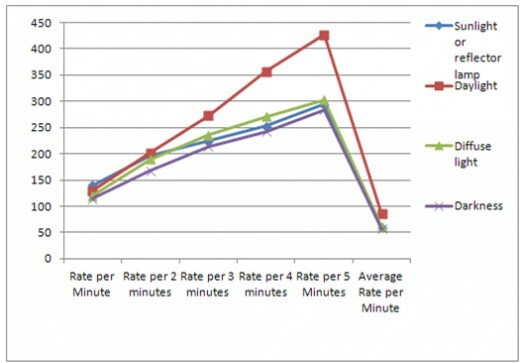 The table above helps to show how the rates changed over the 5 minute period when the test tubes were not under their specified light. The chart above shows how the rate slowly decreases the more time it is out of the certain light. The best light, Daylight, sustains the rate for the longest period of time; therefore it has the best overall rate of oxygen production. Knowing that natural light is better for plants then other types of light shows that the results are not a surprise. These results were expected, while still giving a worthy experiment to complete. It was worthy to be able to determine the exact number of bubbles of oxygen in each type of light contributing to the purpose of this experiment. The results may have some flaws in them due to the counting being done. Students have some inconsistencies in reporting some results. Another error in the results may be how much sodium bicarbonate was put into each test tube. This might affect the results by giving the Elodea more carbon dioxide to help with the process of photosynthesis. If less carbon dioxide was given to the Elodea, then the results would be lower than they should be with the proper amount of sodium bicarbonate. This difference in the results shouldn’t affect the overall experiment success. The results were still what were expected with some minor differences of the counting because the prediction was that the more natural night would hold a greater effect of the production of oxygen bubbles through photosynthesis. One possibility for extra experimentation is testing with a different type of plant or even a bigger container instead of just a smaller test tube. 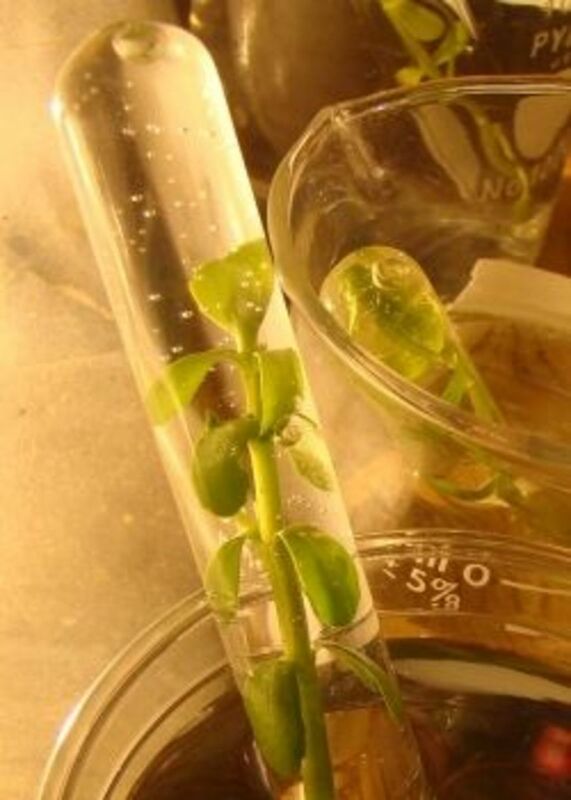 Using a different type of plant could be a possibility because they have different production rates of photosynthesis. Using a bigger container could result in more Carbon Dioxide and light absorption to aid in the process of photosynthesis. It would be interesting to see if these factors actually change the results in a significant way. Even with these possible changes made, the results remain correct and the experiment was completed with great success. The results confirm the hypothesis of the more natural the light, the better the production of oxygen bubbles. Levine, Joseph S. and Miller, Kenneth R. Biology. Upper Saddle River, New Jersey: Pearson Education, Inc., 2002.